The weekend has arrived and those dating are most likely headed out to dinner and a movie, but they don’t know where to sit in the theater. Most know to avoid the first few rows and some will make sure they don’t end up in the back of the theater unless they like being remote. But few know, for which seats the director designed the movie. Theaters range in size and shape and follow the rudimentary formats prescribed by the National Association of Theater Owners and the Motion Picture Association of America. These formats are based on screen ratios and the projector’s “throw” of light based on lumens, curvature of the lens and the screens’ reflective material. Without trying to figure out the complex formulas to determine seating placement, a well-designed theater will provide good seating about two thirds of the way back from the screen. Unfortunately that’s based on typical screens being about 20’ X 47’ and the theater having a total depth of… Nope, let’s keep it simple. Have you ever attended the rehearsal of a stage show? Did you notice that the director always sits in a specific place? Or, how about at a concert venue, did you notice where the mixing board is located? Microphone jacks are typically placed in the ideal location for the director to plug in his headset or microphone in professional, university and high school theaters. This gives him the closest view of the stage, while still being able to see the entire stage. If he moves closer, he can’t get the big picture. If he moves further back, he can’t focus on the detail. In film, the same rule of thumb holds true. When a director is viewing his final mixed film, he is seated based on the screen location and surround sound speakers. Even in the mixing room the director is positioned in the ideal location and makes all the decisions based on that spot. When the show releases to the silver screen the ideal location is about 2.5X the screen height back from the movie screen. If you select a seat in that location, you’ll notice surround speakers directly to the left and right of you. The entire movie was created based on those seats. Any other point of view changes the impact of the film. For instance, if you don’t like horror films you can sit in the back to diminish the surprise factor and reduce the emotional pull on your heart. If you enjoy rollercoaster like action films you can move closer to the screen to keep your head moving and help your stomach churn your latest meal. Regardless of the screening room size, you’re safe sitting 2.5X the screen height back from the screen in order to see the film as the director designed it. 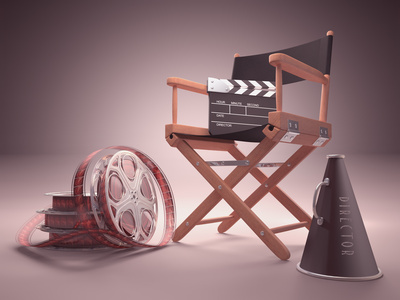 Professional movie directors make most movies, but few in the audience can discern the difference between which of the three types of directors made the film they watch. The three types of skilled directors are: Technical; Performance; and, Arts & Craft. Directors fascinated with the technology know how to capture images that look cool and stir the soul. They are most likely first attracted to splash videos before understanding the subtleties of story-based cinema. He or she works well with the crew, but pretty much leaves the actors alone to do their own thing. Sometimes this relaxed process flows from the director’s inexperience, or ignorance of not knowing how to communicate with the actors. This type of director may have once been an actor. He or she understands the nuances of performance and the depth it can bring to a story. Instead of focusing on the technology, the director spends time with each actor and determines how to draw out the best performance possible. Regardless of the schedule, time is allotted to capture the best performances through coaching, experimentation, and augmented performance technique. This is the rare breed of director who understands the technical and the performance aspects of film production. He or she takes time to work with the actors and tweak their performances, and to help the crew understand exactly what needs to be captured. The director takes these same skills into post-production as well, where he or she represents both the technical and performance sides of the production team in the editing suite. Most technical directors gravitate toward television where story decisions are made by the producers, head writers, and show runners. Performance directors lean more toward live stage shows. And, arts and craft directors typically thrive in the motion picture industry. Unfortunately, all too often directors are misplaced and find themselves battling to survive, rather than thriving in their ideal environments. The best combination is for a director to figure out which type resonates within his or her soul and enter the appropriate market. The same holds true with directors that lean toward specific genres. The sports enthusiast director should think twice about making a Hallmark movie, unless he or she is prepared to stretch him or herself creatively. I’ve directed numerous genres in my life, but I’ve only won highly competitive awards for adventure films. I’ve also won several awards for my dramas, but they came from lesser competitions. In other words, my best combination where I thrive is directing a fun adventure film that’s salted with dramatic moments and humor. That’s not to say I can’t direct other types of stories, I’ve done numerous successful shows outside of my core expertise. But in all honesty they were never on the same level as when I’m paired to an adventure film. Do you know your favorite director’s core genre? Birthed by documentarians to keep shows focused on topic, the focus slugline eventually shifted into use by editors inundated with hours and hours of footage to sort. The simplicity of outlining the focus of a film shifted to long form directors and then to independents. A focus slugline is NOT to be confused with a script header. The header includes the annotation of the interior or exterior, scene name, and time frame of day or night. It is found at the top of every scene to organize the script and simplify production management forms. The focus slugline is typically hand written by the director in the left margin of the script. It runs vertically down the page and gives the “who,” “does,” “what” of the scene. Some directors have sub-focus-sluglines to breakdown the “who does what” by character power shifts. A sample focus slugline is: Dad surprises son. The “who” is the dad, the “does” is the surprises, and the “what” is the son. This focus slugline puts the emphasis on the giver of the surprise; in this case it’s the dad. The director’s goal is to remind himself to put the attention on the dad during filming so he doesn’t’ accidentally shift the story to be about the son in this particular scene. Directors are asked a myriad of questions on set every day and in spite of the plethora of queries he must remember what to focus on within the scene. The Focus Slugline is a quick glance system that allows the director to recalibrate his perspective when its time to roll cameras. In the sample, if the film were about the son, the focus slugline would have read: Son receives car. The “who” is the son, the “does” is the receiving of the gift, and the “what” is the car. The camera shot list in a film about the son would reflect a completely different set of shots than the story about the dad. In longer scenes that have a lot of power shifts between the characters, the director can create a sub-focus-slugline for every new character goal established that drives the overall story. Since the shift in power also shifts the focus temporarily, the use of sub-focus-sluglines helps the director to make sure the focus returns to the right place before the scene ends. Dad surprises son with a new car parked in the driveway. Son runs outside and stares at the sports car. Dad tosses his son the car keys. Son hops in the car, starts it up and shifts into reverse. Dad smiles from ear to ear with pride for his son. Son backs into oncoming traffic and startles other drivers. Dad grabs his cell phone and calls insurance company to clarify coverage. The key to successfully using focus sluglines is to make sure the director gets what he needs when others break his focus on set. The SAMPLE 1 focus sluglines (Dad surprises son. Son startles traffic. Dad calls insurance company.) will work for most directors because it reveals the scene’s beginning, middle and end. Others may want to list every beat for more complex scenes, but seldom will sentences be used unless the information has to be reduced to writing for a treatment or scene synopsis. The “who does what” focus slugline clarifies the emphasis of the film segment with a single glance. It allows the director to quickly regain his concentration and communicate with cast and crew the goals of the shot sequence. And, it also gives an editor a great tool if the script supervisor captures the same information. Click here to view a sample that I created from the “National Treasure” screenplay. I was asked today what the difference in skill or techniques were between a good director and a great one. There is a lot of commonality in how both directors get started in filmmaking, but once they’ve gained experience the great director works specifically on developing his adjectives and verbs. The adjectives are the tools the director uses to convey key information to his cinematographer and production designer. He also uses it to communicate with publicity, studios and producers. The words make the difference between a good pitch and a great one—a higher budget versus a smaller one. Adjectives give color to a conversation and ignite emotions. Since film is an emotional medium, adjectives play a major roll in determining what films get made. Films explained without adjectives fall flat and fail to give the audience an emotional ride that films are known to do. Verbs are the tools needed to adjust the efforts of the actors. Saying, “give me a little bit more,” tells the actor nothing and frustrates her. But, changing up the verb within the direction gives the actor something to play. For instance, let’s say the director told the actor to “urge” the other character to take a sip from the glass and it didn’t play well. The director would explore a more intense version of the same action. He might tell the actor to “exhort,” “push” or “force” the character to take a sip. Each word brings another level of intensity to the scene. The opposite is also true. When the director wants the actor to back off of the intensity of the scene, he merely gives direction with gentler verb choices. By choosing various levels of verbs, the actor is able to picture the exact action their character might undertake. The best news is that verbs are actions that can be played without the actor having to translate what “more” or “less” might equate to. By giving an actor a specific verb to play she can immediately determine what actions her character might take in accomplishing the verb. This frees the actor up from the acting process and allows her to stay in character while playing through a few creative choices. More and more directors have become writers in recent years because they’ve learned a lot about words in promoting their films and directing their actors. They understand the emotional tone of the film and had to learn the words required to describe it to others. They also know what it takes for an actor to play a roll; so learning numerous levels of verbs became second nature to them. Once you’ve learned how to use adjectives and verbs, the distance from being a director to becoming a writer/director is very short. The same is true for a good director becoming a great director. I’ve chatted for a few minutes with numerous directors over the years and I’ve found that the top one percent all think alike. They are captivated by the human condition and explore each character they meet, finding the underlying treasure deep within their being. This newly exposed treasure always contains a form of entertainment that fascinates. The story that rises from the personal backstory brings understanding to the attentive audience. Regardless of ones personal perspective, empathy is drawn and reveals the human condition. Philosopher Martha C. Nussbaum, in her book “Upheavals of Thought,” speaks to the intelligence of emotions. She argues how storytelling rewires us. Her argument can be easily extrapolated to explain why motion pictures alter our culture. She further argues that our emotion is the very fabric of what forms our moral philosophies. “Emotions are not just the fuel that powers the psychological mechanism of a reasoning creature, they are parts, highly complex and messy parts, of this creature’s reasoning itself,” says Nussbaum. A director who is aware that emotions are not a motivator, but instead part of the character’s reasoning can form arguments that change the way people view themselves. Thereby changing our culture. I met a lesbian pastor a year ago and we chatted about what drew her to other women. After she gave me the programmed and politically correct answer, I asked the question in a different way. She carefully shared how she was always beaten by males as a small child and comforted by females. Women provided the only form of love she understood. If I were doing a character study for a film, I’d draw from the pastor’s experiences that shaped how she felt about men and women. Her reasoning was molded by her emotions and the only thing that could change her course in life is the demonstration of a higher love that she does not know exists. As a director, it’s my job to acknowledge the audiences reasoning on culturally hot topics and introduce them to another perspective. When I demonstrate through a character and his or her circumstances similar ideas and feelings, I hook the person long enough to consider the new perspective demonstrated through the main character changing by the end of the story. Top directors always talk about the thesis world, antithesis world, and the new thesis world. The thesis world starts the audience where they are socially and politically concerning their reasoning. The antithesis world demonstrates the things that can go wrong with their version of the thesis world. Every thing is turned upside down and looked at in a fresh way. This is followed by the new thesis world where the director leaves the audience with their version of what our culture can look like. The human condition is where we all must start. It’s where we all live with our flaws and unanswered hopes. We can then explore all the things that could go wrong based on our current worldview. This opens our hearts to better solutions that we consider when presented in love or entertainment. If the information we consider includes a demonstration of what the new perspective proposes, we are ready to embrace it and test it out in our own lives. The logic is sound and it makes sense why all Hollywood films follow this format. What seems illogical is that faith-based films, which are supposed to have truthful answers for our lives, do not follow this process. In fact, many Christian films do the exact opposite and don’t stand a chance of changing our culture. Film is one of the greatest art forms ever created and it’s the only one that directly impacts our culture. Some say its because it includes the other art forms within it, but top directors say its because film starts the audience with the reality of the human condition, explores the flawed alternatives and gives rise to a great demonstration of what life can look and feel like when embracing the main character’s choices in the person’s own life. Mentoring in the moment is an important function of giving back. Not only does it give me an opportunity to help new upcoming filmmakers move up a level in the business, but it also gives me a fresh perspective on what unforeseen industry changes might be slowly approaching. In a recent conversation with a young female director, I was asked, “What are the three most important things that a director brings to a script?” After answering, I realized that there are indeed three specific things a director brings to a script that determines the success of a film. The director brings the story to life by attaching his vision to it. He is responsible for finding the holes in the story and making it whole. He also has the power to determine how it is to be told and position it so the audience can easily understand and embrace it. If the story fails, it’s the director’s fault. One first time director argued the point with me by suggesting he was not at fault, but his bad writer was to blame. I asked him if he was sure and he confidently defended his position. Once I could see that he put his entire defense into the bad writer, I asked why he chose to make the film when he knew the writing was so bad. His argument proved him to be either a bad director or a foolish one for shooting an unworthy story. The director determines the beats of the film and the visuals that will best depict the story. He is responsible for the development of the characters and the emotional highs and lows of the picture. He even holds the responsibility to inspire his team to perform admirably within the confines of the budget. An experienced director with 35 plus features under his belt told me that he left the structure of the film to the writers and director of photography, while he focused solely on the actors. I asked him how the film was translated from the page to the screen without his artistic touch. He suddenly realized that he had given up his artistic choices to chance happenings – When the written word happened to match well with the visual depiction. All directors have an artistic style that evolves into something that few can replicate. When a person watches a Woody Allen movie, everyone knows it’s his, even if his name was left out of the credits. Just sharing director names at a party immediately invokes the look, feel and overall style of his work within the person’s mind. Consider Hitchcock, Spielberg, and Nolan. It’s hard to say those three names without seeing their style show up in your mind’s eye. I recently chatted with an up coming director who was struggling with his first short film. Every time someone helped him improve his story, he lost interest in it and started over. I realized that something about the suggestions must have spun the style of his show within his mind to become something he was no longer passionate about. This was disconcerting since directors always spin the suggestions into their own version that matches their stylistic vision. Directors put their fingerprint on everything they do. It shows up in the perspective from which the story is told to the structure of its emotional beats to the overall look and feel that is presented. The director owns the success of a film and has the three key tools that place his fingerprint onto his work.